[…] The heat has intensified in recent years as a result of the increase in vehicles on the roads, which raise street temperatures. At least 300,000 people in north-west China are short of drinking water because of unseasonably warm weather, which officials link to climate change. Parts of Shaanxi province face drought after January saw as little as 10% of average rainfall, state media say. Frozen lakes are melting and trees are blossoming in the capital Beijing as it experiences its warmest winter for 30 years, the China Daily reported. Dozens are thought to have died as much of the country endures one of its harshest winters for half a century. How many people died in the 2007 heatwave? Perhaps…zero. This is the fourth posting in a series analyzing the information that can be obtained from the available HadCRUT data, recently updated to December 2007. As in the previous blogs, the focus is on rank analysis, since it is widely claimed that global warming can be discerned by the fact that most of the warmest years have occurred very recently. It is actually possible to obtain a rough indication on what is behind the recorded warming in the HadCRUT data by going one step below the usual globe-averaged, year-averaged figures. Note how for example SST/Southern-hemisphere is much more similar to Land/Southern-Hemisphere than to SST/Northern-hemisphere. I have computed the same graphs for all quarters, and for all seasons. (c) It always looks more important to be in the same hemisphere, rather than in the same season or the same surface. 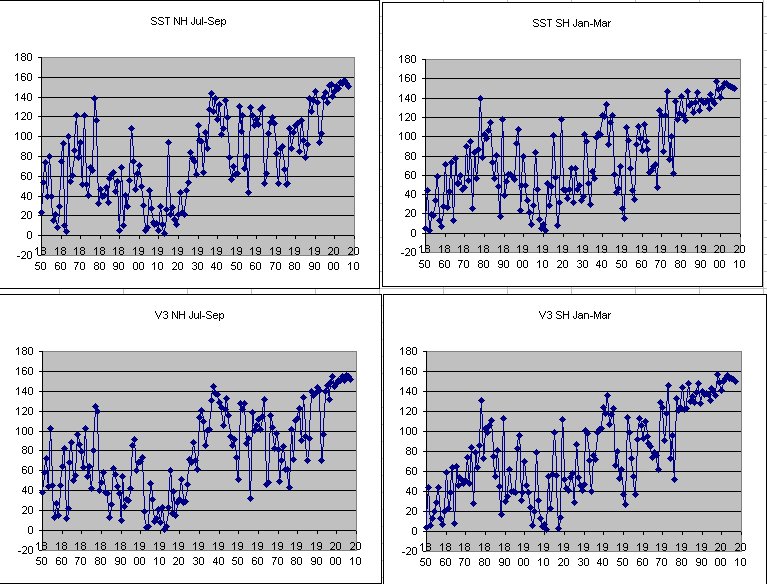 (d) Correlation is highest intra-hemispherically (that is, when, say, the Northern Hemisphere’s land temperatures have placed near the top ranks, the NH sea-surface temperatures too have done the same) with a maximum of 98.6% (Southern Hemisphere, local Autumn) and a minimum of around 80% (Northern Hemisphere, local Winter). 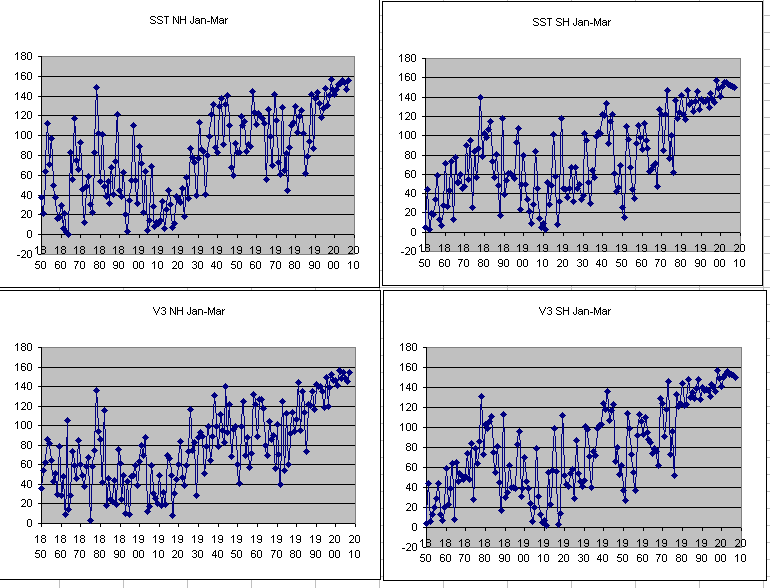 (e) Same-season correlations are among the lowest, with a maximum of 74.5% (Spring) and a minimum of 68.8% (Summer). (f) Among all the season-to-following-season correlations, the lowest values belong to the Oct_Dec-Jan_Mar periods (between 71% for Land, Northern Hemisphere and 80.5% for Land, Southern Emisphere). Conclusions and working hypotheses for the future will be discussed in next blog in the series. The extraordinary 2008 snowstorms in China may have to be remembered also for having reached so far south. The southernmost tongue of white stuff is ominously pointing towards Hong Kong itself. Actually, it can be estimated to have reached the city of Guiyang (26.32N, 106.40E: around 200 miles north of the Tropic of Cancer). In fact, the current weather forecast for Guiyang is light snow, between 1C and -6C between January 31 and February 2 at least. Climate-wise, placed at an elevation of 1,100 meters, Guiyang is know for the occasional flurry, although the average January temperature is 10C. Let’s have a look now at the graphs for yearly averages, ranked from #0 (coldest) to #157 (warmest) for the period 1850-2007. Source is once again the HadCRUT data. We are looking for trends, so instead of simply taking the published average temperatures for the year, I have averaged the monthly ranking for each year taken into consideration. There is anyway no considerable difference between the results of the two approaches. 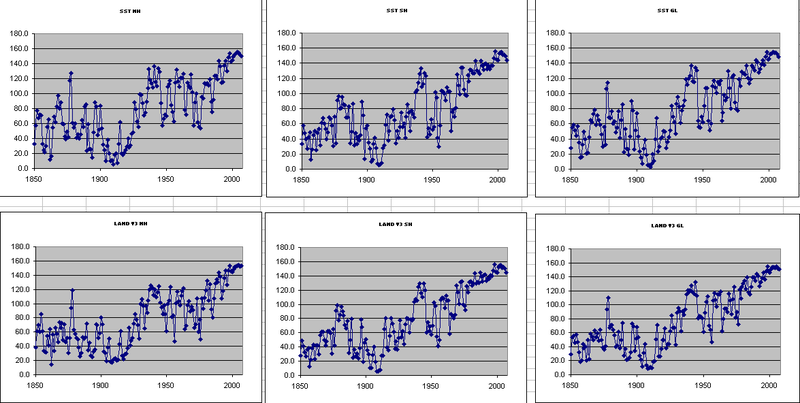 (a) There is a clustering of warmer years during the past 20 years or so. This does suggest an overall warming. Taking the HadCRUT data for good (otherwise there would be no point examining them), it is also possible to say that the “warmest X years happened within the past Y years”. (b) The steepest gradient IN TERMS OF RANKING is by far between the cold years around 1910 and the warm years around 1938. (d) Only Land/Northern-Hemisphere gives any indication of continuous warming to date. (e) Temperatures in the Southern Hemisphere have not been warming on a decadal scale. I have been notoriously bad at making predictions but on the basis of figures 1 and 2 it is plausible that at least for now, and at least everywhere but on Land/Northern-Hemisphere, temperatures have reached a high and may not increase further. Greenland Ice Cap Receding And Disappearing!